If you want a clean and tidy home, what do you do? Do you clean it yourself or do you pay someone to come and clean it for you? Either way, can you honestly say to yourself at the end of the cleaning that the tiles on your floor or on your surfaces look spotless and smell fresh? Or do they just look a little better than they did before? The truth is, you shouldn't really need to call in real tough industrial, commercial cleaning like UCM Services Oakland more than once every few months. But if you never get a great service like the one provided by Oakland Ceramic tile cleaning service, then it is unlikely that at the end of a regular cleaning of your tiles, you are completely satisfied. When we come to one's home to give a full ceramic tile cleaning, you can really tell the difference. We use a cleaning solution together with a high pressure hot water rinse with a fully enclosed vacuum system to ensure that your tiles are beyond spotlessly cleaned. This system means that not only do your tiles stay clean longer, but that when it comes to you cleaning them again sometime after, they are simple and easy to maintain. 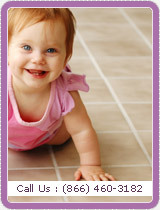 UCM Services Oakland not only specializes in carpet and rug cleaning, but also in tile cleaning. So it is worth contacting the experts to get your tiles cleaned thoroughly by the experts who care. We use state of the art equipment as well as top of the range high quality cleaning products to ensure that your tiles get the expert cleaning they require to look clean to the point of sterility! It really does make a difference when you call in the experts - just once in a while - to take care of tiles, because once we have been there, you will just feel the difference as you look around what will seem like a shiny new home.